Thunder In The Night: The Holy Grail? It's arrived. The mug. The chalice. 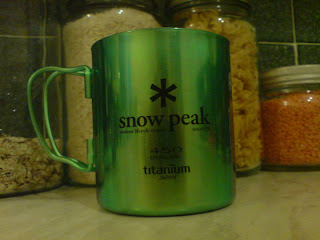 Several grams worth of double walled titanium extravagance. It's light, the handles fold, my water bottles fit snugly inside and it keeps my brew warm. Yes, it's green but not that green. You see, and i'm guessing a bit here, it's probably constructed of cheap (relatively) and plentiful Russian titanium, fabricated in Japan (it says Japan on the side), shipped to America where it sat on fleaBay waiting for me to order it and have it shipped to Blighty. In a little over 5 weeks it will leave with us for our new life in Norway, only a couple of hundred miles from the Russian border. And it managed this circumnavigational feat for a smidge over £20. I dread to think of it's carbon footprint. But isn't it pretty! Aw, man. It's the colours...if they were all silver I wouldn't want another one.